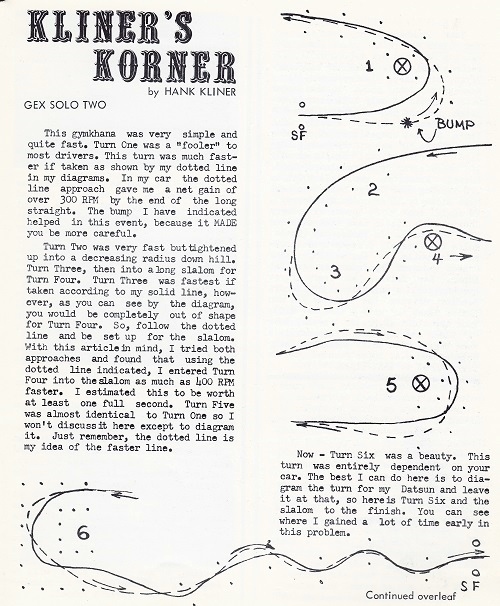 Hank Kliner wrote many articles for the Gazette, His monthly column was titled "Kliner"s Korner" and covered many topics related to his specialty "Slaloms ", his term for gymkhanas and SOLO events. In the October, 1968 Gazette he gave a "How I Did It" on the GEX SOLO Two held at GEX on North Eastern, the current location for The Old Paris Flea Market. Below Hank's words is a current day aerial photo of GEX, courtesy Google Maps. I have attempted to draw the course using Hank's drawings. 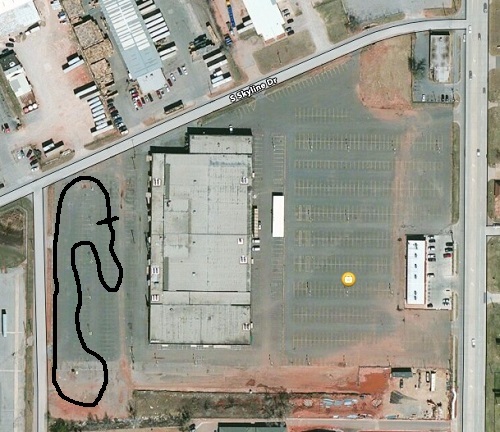 The GEX West lot was used numerous times in the sixties and seventies by Oklahoma Region. The exed circles in the drawing are light poles which made excellent "pylons" before the advent of SOLO Safety Stewards. These "pylons" never moved in the Oklahoma wind, and no one, to my knowledge, ever knocked one over or even hit one.